As a child I tripped over tubular Caro’s, lumpy Moore’s, bendy Flanagan’s and various other bits modern sculpture which periodically sprouted on the manicured lawns of Cambridge. Some forty years on this combination of objects of the modernist epoch with the lawns of the learned still pervades. And today Messrs Flanagan & Caro continue to give me work for the eye to do amongst a broader church of branded twentieth century pioneers. I’ve been visiting Sculpture in the Close since its inception in 1996 and it has always been successful in mixing heavy weight art amongst the historically charming architecture. However one persistent observation I have of this biennale (albeit hitherto unshared) is just how under marketed this show is in terms of its profile, all things of status considered. There is no flashy publicity or big glossy advertisements. Just a gentle web presence, a small poster and when you do get there, a modest publication. There is no in situ labelling. The series title eschews any temptation to bedazzle the possible visitor with seductive strap-lines. In a world where cultural events are dominated by media hyperbole and web extrapolation pervades. In order to grand-stand the oft insignificant. I find this rather refreshing. There is the stuff, the place and of course the viewer and that, (not forgetting a dose of curatorial vision) seems the essence of the thing. A here and now encounter of work, place and the cerebral. A subject needs stepping stones to keep growing and these guys were amongst the key players that helped pulled British Sculpture out of the pitiful mire that left it lagging for centuries behind Europe. Half a century later and with several generations of rookies subsequently stirring up the sculptural stew, how do this lot stand up today? The show is underscored as a tribute to the memory of Barry Flanagan who died in 2009, and he is the most represented artist. Also on show are works by other luminaries, like Caro, William ‘the Language of Sculpture’ Tucker, Phillip King and Tim Scott. It is great to get re-acquainted with amorphous lumps of Tucker. Book cover art, can often disappoint. But these absurd metal blobs, appearing natural, animated and organic, but emphatically anti naturalistic in their agenda, still manage to hold their own, particularly against this setting and it’s adjacent Edward Scissor hands bushes. So Tucker for me both earned his stripes and holds onto them. The Caro metal piece worked well for me, but compared to his epic, installation of industrial timber sleepers at Jesus in 2009 (which was an absolute stunner in terms of its transcendent properties, ‘Povera’ implications, scale and its ability to counterpoint yet harmonise with its locus) is as a relatively modest representation. But I am ever impressed at how Caro throughout his impressive career has continued to raise his game. On then to the star of this show. Quite rightly Barry Flanagan. What I love about his works from the start to the finish of his career is his sheer delight in the process, his engagement with the tactile and his commitment to generating an art of the uplifting. This strategy of play over cynicism, love of material in relation to rather than replacement of concept makes him a true sculptor’s sculptor. 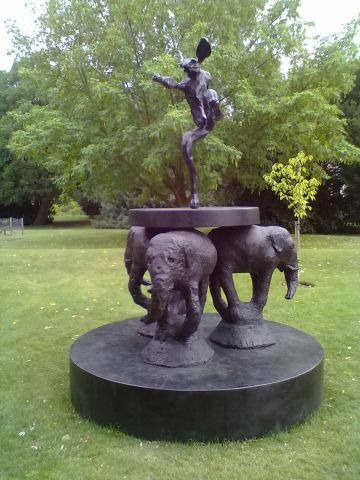 There is a joyous absurdity to his works from his Hare bells to the work pictured that comprises an exuberant trio of Indian Elephants, which support a round table sporting a kick boxing hare. The Elephants smaller than life, the Hare larger than life. Normally, I will confess, bronze (and it is endemic in this show) causes me difficulties due to its implicit associations, commodity status and its limitation to encode much beyond the history of sculpture. But here the material (and this is a rather peculiar thing to encounter in any interesting recent sculpture) is very much a vehicle, not an integral element per se, as found in a work such Helen Chadwick’s Piss flowers (where the transcoding of the banal to the weighty is implicit in the media choice). And it is a vehicle that captures a truly skillfull childlike media manipulation rarely seen since in art Picasso. This work and many others are quite simply (and much more beside) an utter joy. There are plenty of other works to go at to boot by Flanagan and the others. Tie this in with a visit to the excellent Andrew Lanyon show at Kettle’s Yard, some ‘A’ grade history painting at the Fitzwilliam and you will have a very good summer’s day out.